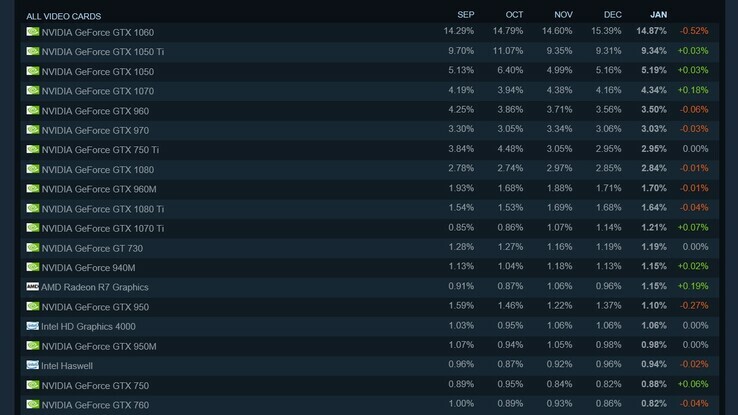 Steam has released the details of its hardware and software survey for January 2019. In terms of PC video card usage, Nvidia absolutely dominates the chart with 74% of users having a GPU from the green team. The GeForce GTX 1060 is the most popular graphics card, while the highest-ranked non-Nvidia product is AMD’s Radeon R7 Graphics in 14th place. 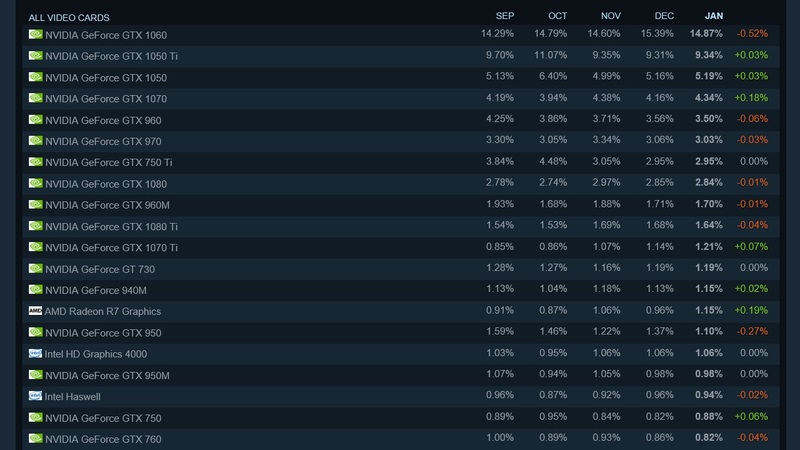 The software distribution platform Steam has released a monthly update of its hardware and software survey. The survey is optional and anonymous, but it should still give a general idea of what hardware Steam subscribers are using overall. Nvidia leads the charge in the video card rankings, followed by AMD, Intel, and Others. Nvidia’s 74% share is massive compared to AMD’s 15.3% and Intel’s 10.6%. As for individual cards, almost 15% of Steam users who completed the survey utilize an Nvidia GeForce GTX 1060 in their system. Only three GPUs have a share over 5%: the GTX 1060, the GTX 1050 Ti (9.34%), and the GTX 1050 (5.19%). The highest non-Nvidia graphics solutions are AMD’s Radeon R7 Graphics with 1.15% and the Intel HD Graphics 4000 with 1.06%. Interestingly, the Steam survey rankings show which items are trending and which are losing favor. This time, the AMD Radeon R7 Graphics is the table champion with a growth of 0.19% from December to January. The top list is much less occupied by Nvidia products now: The top 10 features six Nvidia cards, three AMD GPUs, and even one Intel product (HD Graphics 610). The big loser for the month is the most popular card overall, the GeForce GTX 1060. Its figures dropped by 0.52%. As for new products, members of Nvidia’s GeForce RTX line-up have made some appearances. The RTX 2070 has a figure of 0.33% and had a healthy rise of 0.16% and the RTX 2080 gained 0.31% share and growth of 0.09%. A few people even have the RTX 2080 Ti, which has 0.15% share. This data can be interpreted in a way that suggests people are certainly purchasing Nvidia’s Turing-based GPUs, but not in the numbers the green team would prefer. AMD’s Radeon RX Vega also makes a new showing for the month, just beating out its rival's RTX 2080 Ti, with 0.16% share.